I'm commemorating Pearl Harbor Day with a look at God Bless America. Here is a clip of Kate Smith singing a rousing version in the 1943 film This Is the Army, starring Ronald Reagan and Joan Leslie. 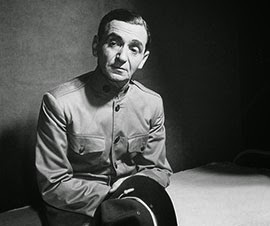 God Bless America was written by one of this country's greatest songwriters, Irving Berlin. He originally wrote the song for a 1918 musical revue Yip Yip Yaphank, a humorous take on Berlin's stint in basic training at Camp Upton in Yaphank, New York. Yip Yip Yaphank was a huge success with Berlin himself performing the show-stopping number, Oh! How I Hate to Get Up in the Morning (we're with you on that one, Irving). After careful consideration, Berlin removed God Bless America from the show because he believed its serious tone did not fit with the comical hi-jinks of the rest of the revue. Irving Berlin getting ready to perform "Oh! How I Hate To Get Up In The Morning." God Bless America stayed on the shelf until 1938. Singer Kate Smith, a popular radio personality in the 1930s and 1940s, wanted a new song for her Armistice Day (now Veterans Day) broadcast. Smith requested a song that would be a prayer for peace and protection for America as much of Europe plunged headlong into World War II. Berlin dusted off God Bless America, adding an opening stanza and changing some of the lyrics to be less political and more spiritual (for example, "Stand beside her and guide her to the right with the light from above" was changed to "Stand beside her and guide her through the night with the light from above). The original radio broadcast is below. God Bless America was an immediate sensation, with all of the copies of the sheet music rapidly selling out. The song became a wartime anthem after the Japanese bombing of Pearl Harbor on Dec. 7, 1941. Smith reprised her original radio broadcast for the 1943 film This is the Army (clip above), which tells the story of a young soldier (Ronald Reagan) who is the son of a song-and-dance man (George Murphy) loosely based on Berlin himself. 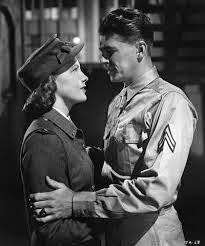 Joan Leslie and Ronald Reagan play wartime sweethearts in This is the Army (1943). on May 11, 1888, in Russia. Berlin was Jewish and he and his family were the targets of virulent persecution by the Tsarist regime. Berlin's earliest memory was of hiding in a ditch while Russian troops burned down his home. 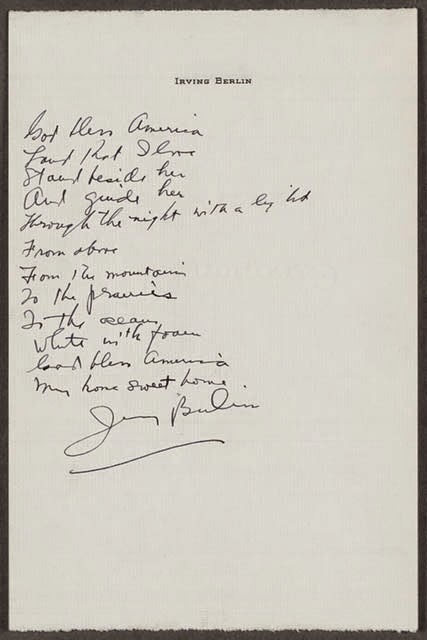 Irving Berlin's handwritten lyrics to God Bless America. Berlin and his family immigrated to the United States in 1893. In the family's early days in New York, Berlin remembered his mother always saying "God Bless America" because no other country would take the family in. Many years later, he remembered his mother's words when he penned his heartfelt prayer. "To me, God Bless America was not just a song but an expression of my feeling toward the country which I owe what I have and what I am," he said. Here is a clip of Berlin performing God Bless America in 1968. Sources for this article are America's Songs: The Stories Behind the Songs of Broadway, Hollywood and Tin Pan Alley; As Thousand Cheer: The Life of Irving Berlin; Broadway Musicals: A Jewish Legacy and The Library of Congress. Very nice. Thanks for the backstory.